The recent March/April 2013 issue of Fine Gardening magazine has a small article on page 16 about Clematis Serious Black (also known as Clematis recta Lime Close), in which the Northwest Perennial Alliance (NPA) is erroneousely identified as a source. As NPA is getting requests for the clematis, they asked me if I knew of a source. Update: Turns out that NPA is in fact a source — for the SEED of Clematis Serious Black. Please see comment from Fine Garding below for details about how to obtain the seed. And remember, a seedling does not necessarily look like its parent. Apparently, Clematis Serious Black has not made it across the pond in enough numbers yet for selling. But Clematis recta ‘Purpurea” is available–-I have it myself and love it. 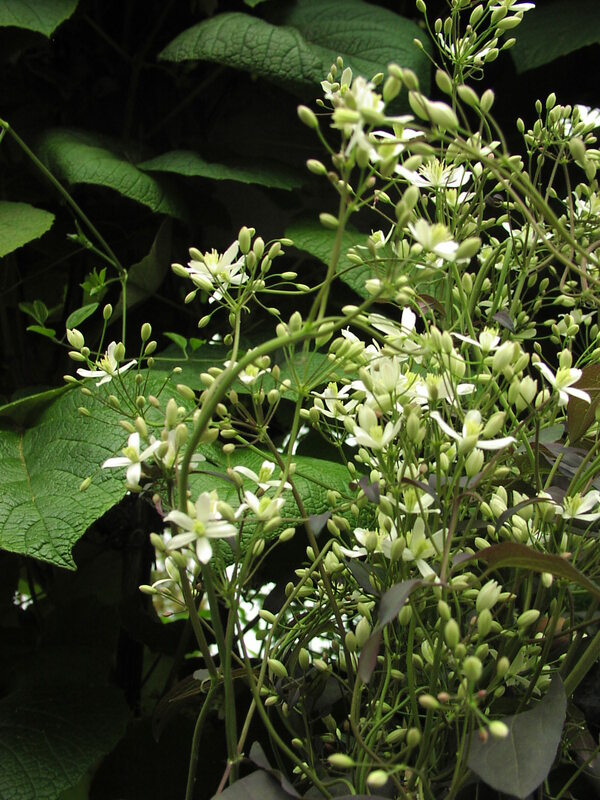 While its leaves are not quite as dark as Serious Black, Purpurea has strikingly rich dark purple leaves in spring and early summer, then blooms with white starry fragrant flowers. It really is a lovely plant and might just tide us over until Serious Black makes the scene in this part of the world. Clematis recta ‘Purpurea’ is currently available at Joy Creek Nursery in Oregon, where you can mail order it. It is also available at T&L Nursery, a wholesale nursery in Redmond, Washington. 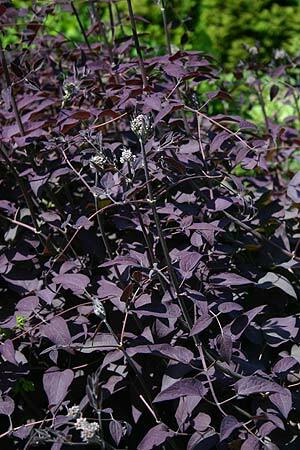 Trust me — as soon as I can find one, Clematis Serious Black will grace my garden! NEXT POST: Brushwood Nursery, the last but not least of my three favorite mail-order nurseries for clematis. Thats a shame, I was ready to go out and get one. Somehow I don’t think you are the only one, Linda! Both members and non-members are able to purchase the seed by filling out the order form that is listed on this page. Thank you, Danielle, for the clarification! Just remember, everyone, that a seedling of Clematis Serious Black may — or may not — look like it’s exotic parent. Its now available through the mail via Wayside Gardens. Thanks, Sarah, for letting us know!